Goodson Park whilst a wonderful old ground it is rarely a place that saints get a decent result, however after two very poor home performances, bringing 2 defeats Saints fans were looking at this game to make amends. Puel made 6 changes, not surprising as the West Brom home game, was just 48 hours before, Fonte, Cedric, Ward-Prowse, Clasie, Redmond & Rodriguuez all came in. After just 5 mins, another change was enforced as Cedric gained a head injury.to be replaced by Stephens. Saints seemed to start the game the more lively, yet Everton had the first shot of the game it came from Barkley, well saved from Forster, shortly after that Romeo had a free header from a Ward- Prowse corner, which got cleared off the line, Everton broke away which ended up with Lukaku who put a weak shot wide, Jay Rod, did manage to get the ball in the net, but not only was he offside, he used his hand to put the ball in, after that the game deteriorated, we had a long period of neither side being able to put 2 passes together, to sum up how bad the game was, there were nearly 39,000 people there, yet you could hear the players shouts above the crowd! Jay Rod did well to beat 2 players to put himself into a great position but his shot ended up high and wide. You could virtually see Saints players heads drop from this point onwards. Saints looked tired and very much second best, Everton boosted by the goal became more dominant. 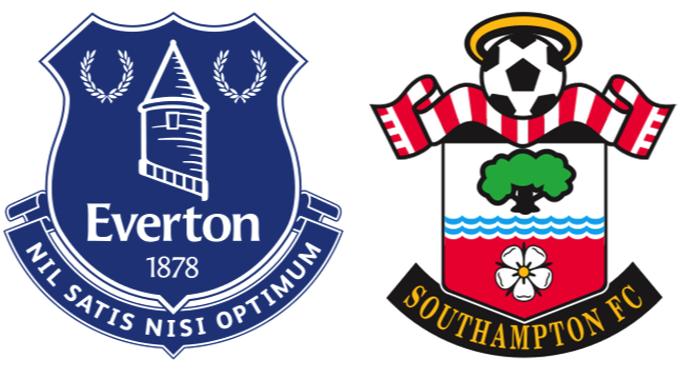 Saints players and fans just needed the game to end, but it was no real shock when Everton got a 3rd goal. Lukaku was given too much space and put in a terrific shot, which gave Forster no chance. At this point I realised Shane Long was on the pitch, I honestly don't know at what point he came on, or if he even touched the ball. Just before the end Boufal put the ball through to Jay Rod but he shot embarrassing wide.